Did you know it’s possible to lose weight without going to the gym? That’s right, you can do full bodyweight workout routines at home that will give you just as good results (or better) than doing a gym workout. Basic bodyweight workouts are strength training exercises that don’t require free weights or machinery, and instead use your own bodyweight. From legs and arms to chest and abs, you can tone up and slim down using your own body resistance. Take a look at the best bodyweight workout routine ideas for beginners! Bodyweight workouts are one of the most efficient ways to lose weight. They are a great alternative to strength training workouts that use complex machines. Bodyweight exercises are totally accessible wherever you are, so you can get a workout in anytime that works for you. No excuses! If you’re using bodyweight exercises for weight loss specifically, the best thing to do is focus on compound movements like squats and pushups instead of ones that isolate one body part at a time. When you challenge your entire body, you’re able to burn fat faster. The awesome thing about bodyweight workouts is that they help build muscle throughout your whole body. As you gain more muscle, your metabolism speeds up, and your body becomes a fat burning machine. Want to know more about basic bodyweight workouts? These books will teach you all about how to do bodyweight workouts and explain which exercises to do to help you lose weight. They’re a great travel companion to help you mix up your workouts while on-the-go! If you want to watch bodyweight workout DVDs from the convenience of your living room, here are 7 awesome videos we love! If you thought strength training had to be done with weights, think again! This low impact workout demonstrates how you can strengthen your body using only your body weight! From wide to narrow push ups, to forward to back lunges, and tip toe sumo squats, this 20 minute workout is sure to make you sweat, build your muscle, and slim you down! This abs-focused strength routine works your core, making you stronger and helping you lose weight. The instructor brings you through a 4-minute warm up, where you’ll do four different moves twice, and then a 22-minute circuit with 3 rounds of 45 seconds of work and 15 seconds of rest. You’ll finish off with a 4-minute tabata, which is a form of high intensity interval training. All without equipment, this will be one of the best workouts you’ve ever done! Sometimes a quick 15-minute workout is all you need (or have time for!). This workout is challenging, but with modifications for beginners, you’ll be totally fine if you’re a newbie to bodyweight exercises! This HIIT workout is comprised of five exercises, which you’ll do for 50 seconds, followed by 10 seconds of rest. If you need to rest for longer, that’s totally fine, just pause the video and take it at your own pace! You’ll perform exercises like high knees and jumping jacks, lung backs with kickouts, and sit ups to work your entire body. The instructor in this video has one goal: To help you live a strong, balanced, healthy life without losing any of the fun along the way. And that’s what he’ll help you do in this bodyweight bootcamp video. Every move is a full body exercise that will leave your muscles quivering and your body dripping with sweat! They warm you up, work you out and cool you down, all while helping you stay motivated along the way! The only thing you need for this workout is your bodyweight and a chair. Warm up and cool down aren’t included, so you’ll need to make sure you do those on your own! You’ll do each of the 12 exercises for 30 seconds with a 10 second rest in-between. From jumping jacks and wall sits to push ups and step ups, this 7 minute bodyweight workout will have you losing weight in no time. This workout balsts your whole body into shape to help you shed those unwanted pounds. You’ll get the perfect mix of strength and cardio, and there are options for all fitness levels, whether you’re beginner, intermediate or advanced! She explains how to get the proper technique for each exercise to ensure you’re getting the most out of your workout. It’s a tough one, but the results will be worth it! If you want to feel that burn while you workout, this video is just what you need! After the warm up, you’ll do 12 reps of each exercise, ranging from one legged squats and squat jumps to leg extension pulses and tricep dips. She’ll keep you motivated as you work though this fat burning workout, so you can make it until the end! Using every inch of your body, these exercises will help you get the body of your dreams. If you’re new to bodyweight workouts, these products and exercises will help you get started right! Complete these workouts to tone up, slim down and get the body you’ve always wanted, without the gym or any equipment! 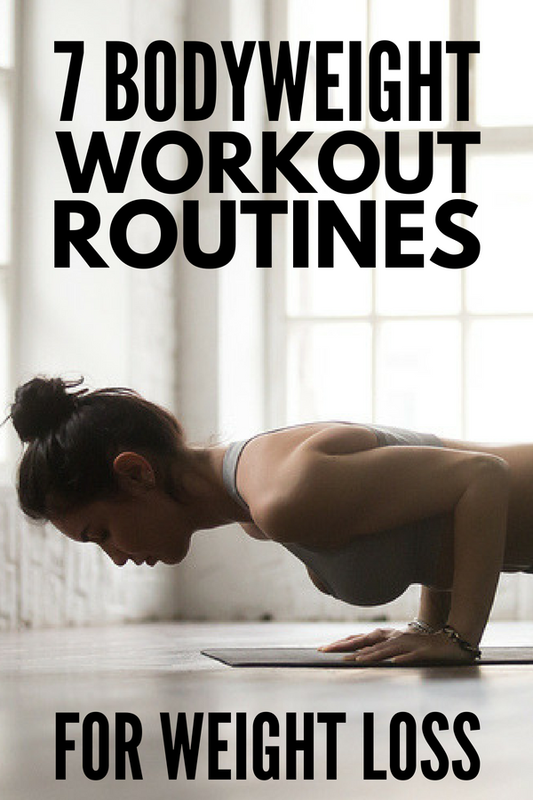 If you loved this post on bodyweight workout routine ideas, make sure to share it on Pinterest! And if you want more workout tips and ideas, follow our Fitness board on Pinterest!